I have been struggling these last few days on what to post about one of our Honored Bosom Buddies who lost her battle with breast cancer, Robin Gray. 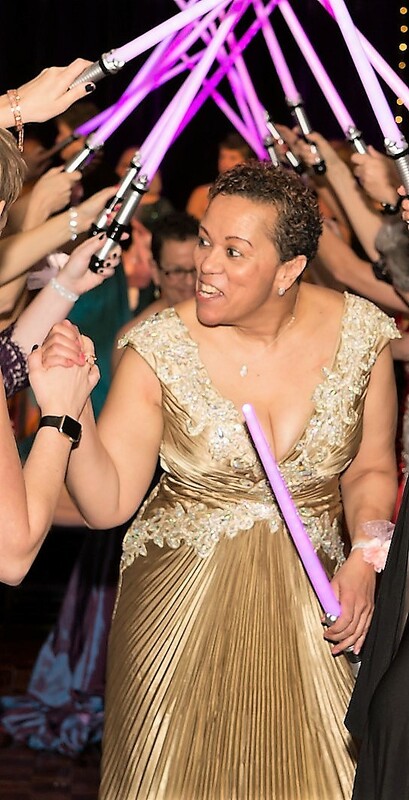 Last year, when we picked up the ball gowns from Deja Vu Boutique they donated to our Honored Bosom Buddies to wear to our 6th Annual Pink Tie Charity Ball, there was a gold dress which stood out from all the other 68 dresses. The owner of the boutique, Kirsten Sapp, commented how that dress was going to be just beautiful on someone! That someone was Robin Gray. She wore that dress of gold perfectly and carried herself as a queen that night as we celebrated her and all our new Bosom Buddies. Not only did she participate that night, but she volunteered in the basement helping to tie bows for other Bosom Buddy Baskets to be given to other Bosom Buddies even though her fingers hurt from the side effects of her chemo she was going through. Believe it or not, but Tonight we are hosting our dress fitting for our new 7th Annual Pink Tie Charity Ball Bosom Buddies to wear to this year’s ball and Robin will surely be thought of. She was a humble, kind, strong, genuine and beautiful person who touched a lot of people and who will be missed by many.